So I finally took the time to understand how the icosian calculus works. It turns out that it's actually quite simple, geometrically (in the linked article it tells you what to do, given a flat graph of a dodecahedron, also pictured in the image), but it results in a 60-dimensional space (2 dimensions per edge of a dodecahedron) if you reinterpret it as some sort of "Icosian number". - However, this same process should work for any flat graph where each vertex has the same number of outgoing edges. So I picked one of the simplest ones: I constructed the equivalent idea for a triangle. This results in a 6-dimensional space (2 dimensions per edge) which might be doable. Our first base-move is called . It flips the direction of the arrow. It sort of acts like a . Our second base-move is called . For it you fix the tip of the arrow and rotate it along to the next edge, counterclockwise. Note that, for the triangle, the direction of the rotation for the -move doesn't actually matter. But if you were to try this same construction for more complicated graphs where each vertex has more than two edges coming out of it, it would. For the triangle, both of our moves are self-inverse: - the -move actually obeys where is the number of edges going out of a vertex. There are 15 standard 2D slices and 20 3D slices to check out. - Though presumably, as always, there will be a lot of symmetry between different slices. I assume any of the directions together with either x or y will always look the same, as well as any of the directions together with v or w. Directions u and z might be more unique. So the most interesting slices probably are ones containing u and z and either x/y or v/w. which probably will also look interesting. Since the original work is called "icosian calculus" (from icosahedron), I think the mulitplication table above should be called the "triangular calculus" and the corresponding number system would be the "triangular numbers"
This is how it looks like, applied to a triangle. It reminds me a lot of (though not the same as) Timothy golden's polysign numbers http://www.von-eitzen.de/math/PolysignNumbers.pdf. Basically i and k we're the 2 directions along the triangle. He discovered that for 2 dimensions his algebra was equivalent to complex numbers. For 3D he drew a Mandelbrot set but I think it turned out to be just a sheared 2D Mandelbrot prism. By the way, something equivalent to this should be possible for any polygon and any platonic solid. Though the dimension of the algebra is twice the number of edges of the shape, so it quickly becomes somewhat intractable to write down the corresponding rules. Tetrahedral rules are 12D already, for instance. It's also technically possible to try this for regular euclidean or hyperbolic grids, but that would give rise to infinitely many edges, so unless something clever is done it'll probably remain a mere theoretical possibility. I suppose it's similar to Polysigns in that there sort of are multiple directions present. However, the rules from which this arises are completely different. And also, say, isn't literally , i.e. - it's just that flips arrows in the diagram I inserted in my first post. There is a 3D subgroup which may also be interesting. Not sure. It corresponds to only going along the triangle in the "positive" direction (1, ik, ki). Interestingly there doesn't seem to be such a subgroup for the "negative" direction: "negative" values (i, k, iki) become positive ones if you multiply them. - This is equivalent to "minus times minus is plus". It's what you get when you introduce a constant . Then either or take the role of , while the other one will be . This, I think I remember, already was tried, and wasn't particularly exciting. It should be symmetric in y and z, so for the most part it should suffice to check just a 2D slice with x and either y or z. It's simply our bog standard split-complex numbers. Also Mb supports only 4d so it might be hard to port it. Are you saying I should use different variable names? Well those should matter little, right? Just pick what ever your software of choice prefers And swapping them around arbitrarily should work just fine too. All that does, after all, is mirror the resulting set in the corresponding way. I tried implementing it in Fragmentarium but just got a blank screen, maybe someone can see what I'm doing wrong and fix it? I now have three more tables that are only four dimensional and based on shapes with only two edges, namely the digon and a shape you get by opening up this shape on one side, where you get two variants (is the 1-state initially facing to the vertex or to an open end? ), although I think that the two corresponding tables are probably technically the same, as in they would likely result in the same picture. Regardless, since 6D seems to pose a challenge right now, perhaps try these 4D ones instead. DarkBeam you mean the two-edged variants? I'll give you the formulae but I'd urge you to learn to read the multiplication tables too: They are super useful, pretty straight forward and nicely compact. I'll try to explain them to you first. To read it, you go "first of row times head of column equals entry". Let's read the first row. Its leftmost entry is 1. So we know it's . Next, read the head of the column. It's another 1. So we know it's . Finally, the point where they meet is another 1. So we now know that, in this system, . How exciting! The very first entry is the same as before. It follows the exact same process as above. .
Next, what about the second row first column? A multiplication table that's symmetric along its primary axis, like this one, is commutative. I suspect this to look rather boring. It's probably, as said before, just the split-complex quaternions? Although I can't recall whether those would commute as this does. The other two tables, at any rate, do not commute, so something different must go on there. So next, "Two Edges Infacing". - By the way, the labels I chose are, of course, arbitrary for the resulting multiplication table. They did come from what operations are possible at any given moment on a pair of edges connected at one end though. 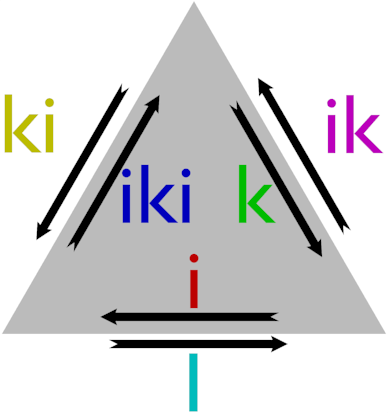 That's why "Two Edges Outfacing" doesn't have k on its own but it DOES have iki. The resulting images look like an egg, not worth posting, sorry. Oh oh i want to see them! I suspect that there is a sort of error going on in the formulas. Why all terms are positive? No formulas in the database have all terms positive. Also I suspect (ai + aik) repeated in three terms does not look fine. Normally there is a sort of cycling.